March Immunity Community Connections - Immz Schedules Going Digital! 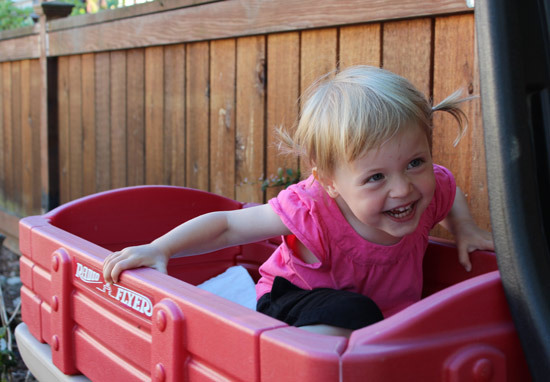 It's been a busy month with lots of activity and a continued national spotlight on WA State and the measles outbreak. Check out this photo of WithinReach CEO, Kay Knox and other WA State immunization leaders pictured with U.S. 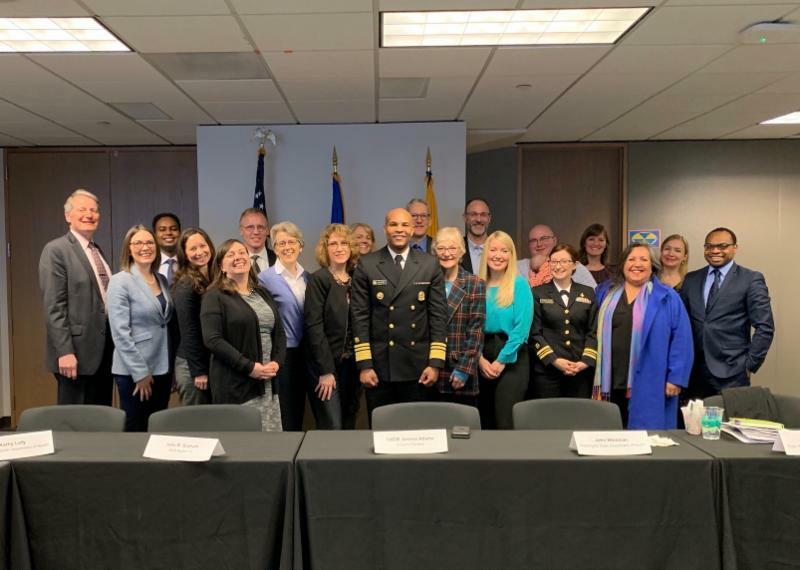 Surgeon General VADM Jerome Adams at a roundtable discussion on measles and vaccine hesitancy this week! We have some announcements at WithinReach related to new staffing and the laminated schedules. Please read below for updates and much more. King County, Washington is home to 40,000 immigrants and refugees from East Africa. 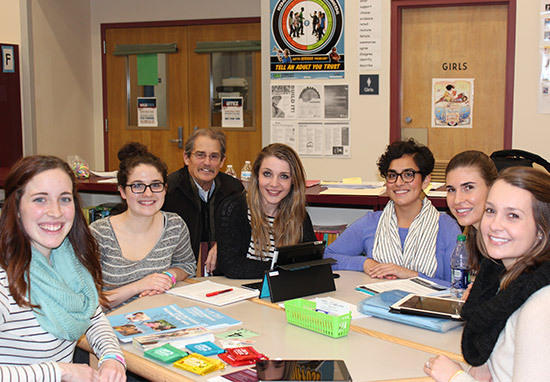 Focus groups and surveys with parents from King County East African communities have identified limited awareness, misperceptions, and lack of strong health care provider recommendations as barriers towards HPV vaccination. 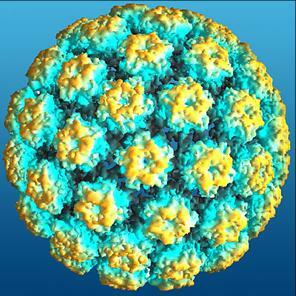 This free e-course, presented by Dr. Anisa Ibrahim summarizes the most up-to-date information on HPV infection and HPV-related cancers, and vaccination recommendations. Additionally, this course offers suggestions for successful HPV vaccine communication with patients and parents from East African communities, common concerns, and suggested responses. Register and take this e-course today! 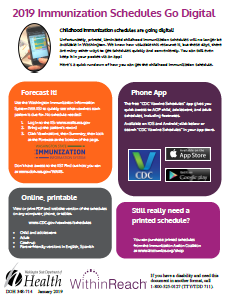 2019 Childhood Immunization Schedules Are Going Digital! We're extremely excited to announce that WithinReach has hired Colin Rhodes, as our new Coordinator of Community & Systems. Colin started on Friday, March 1st and will focus his efforts around our immunization body of work..
Colin comes to us from Public Health Seattle King County (PHSKC) where he worked as the project lead on the Climate Health Action Team and supported the development of 11 community health boards in South King County. Prior to that he served as an AmeriCorps member at PHSKC. 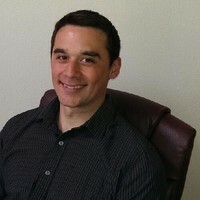 Colin is currently getting his Masters in Public Health through the Executive MPH Program at the University of WA. Please give him a warm welcome at our next IACW Quarterly Meeting! On Tuesday, March 6th, HB 1638: Promoting immunity against vaccine preventable diseases passed off the House floor with a vote of 57 to 40. Regarding n ext steps, the bill will go to the Senate and should be referred to Senate Health Care committee, where it will require a hearing and will need to be passed out of committee by April 3rd. Click here for information on HB 1638. Senate Bill 5841 : Modifying Certain Immunization Provisions passed out of the Senate Committee on Health & Long Term Care on February 22nd and has been placed on second reading by Rules Committee. 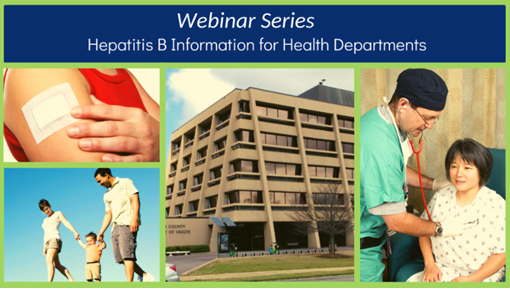 Hep B United and the National Association of County and City Health Officials (NACCHO) are excited to present a 3-part webinar series on local strategies to eliminate hepatitis B. 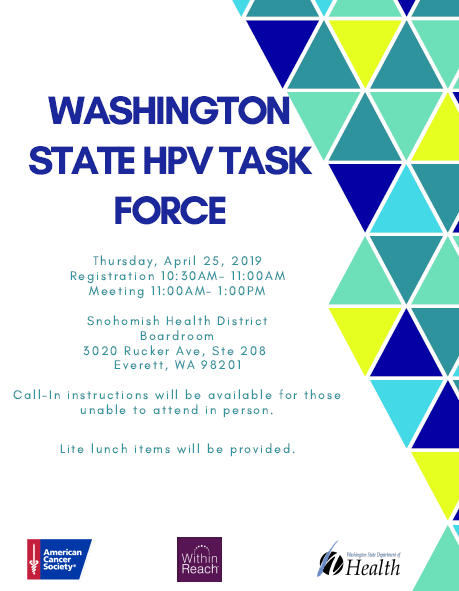 Join us for updates on the current state of hepatitis B (HBV) in the U.S. and to discuss local health department efforts and model programs to increase hepatitis B testing, vaccination, and linkage to care. Register today for Part I. 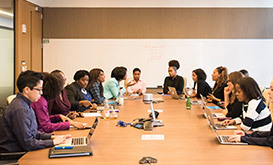 Join the CDC for an NIIW planning webinar on March 12, 2019 at 10:00AM. During the webinar, participants will learn about NIIW planning tools, digital communication resources, engaging partners, and how to get involved with CDC activities planned for the week. 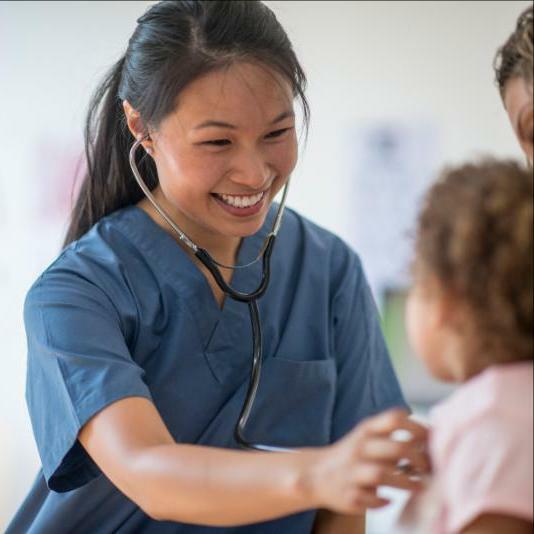 Immunize Nevada will also share lessons learned from their experience building community partnerships to support infant immunization during NIIW and throughout the year. Register here. 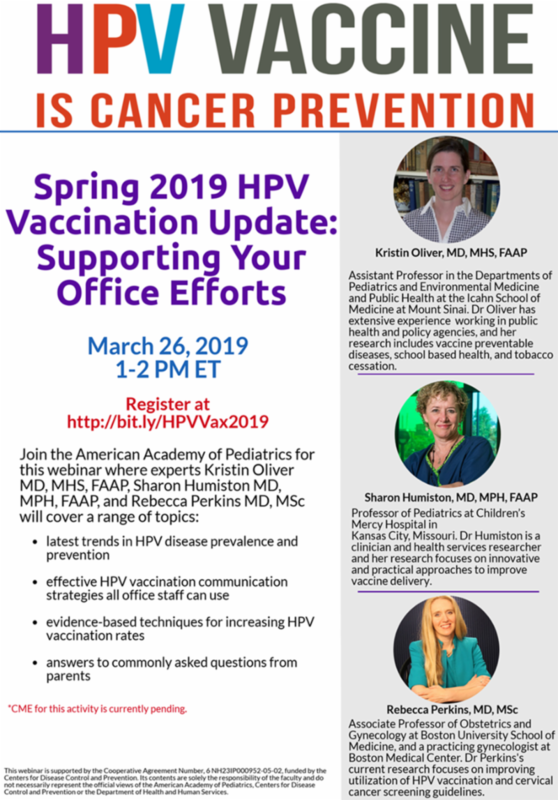 Join the American Academy of Pediatrics for a webinar on March 26th at 10am to learn the latest on Human Papillomavirus (HPV) vaccination. 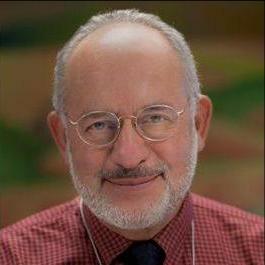 A panel of experts in pediatric primary care, health communication and obstetrics and gynecology will cover a range of topics including the latest trends in HPV disease prevalence and prevention, effective HPV vaccination communication strategies all office staff can use, evidence-based techniques for increasing HPV vaccination rates, and answers to commonly asked questions from parents. Register Here .